Government has temporarily shut down 11 gold mining companies for non-compliance with mining regulations in a drastic measure to curb gold leakages and increase deliveries. Gold leakages have been cited as a major contributor to the decline in gold sales from 27 tonnes in 1999 to 12 tonnes per year now. Government’s target is to raise gold production levels to 30 tonnes per year by 2018. Cabinet this week approved measures by the Ministry of Mines and Mining Development in conjunction with the Ministry of Finance and Economic Development aimed at increasing gold production and ensure effective accountability for sales to Fidelity Printers and Refiners. The measures include establishment of a gold compliance enforcement co-ordinating unit comprising the police, the Reserve Bank of Zimbabwe, Environment Management Authority, Zimbabwe Revenue Authority and Ministries of Mines and Mining Development, Finance and Economic Development and Local Government, Public Works and National Housing. Teams will be tasked to monitor activities at specific gold mines to ensure that all the extracted gold is properly accounted for. Government will also establish gold service centres to cater for small-scale miners, with the first one being expected to be established at St George’s in Zhombe. Mines and Mining Development Minister Walter Chidhakwa said at a press conference yesterday that the 11 companies were found guilty of non-compliance with the gold mining and marketing procedures, with most of them failing to keep proper records of minerals being extracted and sold. Some records of extracted gold did not correspond with the mineral that was sold at Fidelity Printers and Refineries, pointing to serious leakages. “Following the Compliance Monitoring and Enforcement operations conducted by the Reserve Bank’s Exchange Control over the last three months, a number of small-scale gold producers were found to be non-compliant,” said Minister Chidhakwa. The mines where operations were suspended are: Taford Milling Centre (Kadoma), Hollies 6 (Kadoma), Munyati River Ranch Mine (Kwekwe), St Kilda 5 Mill (Pickstone), M Mubaiwa Milling (Munyati), Croco 1 and 2 (Esigodini), Willow Ash Mine (Fort Rixon), Makwe 24 Mine (Gwanda), Flora Mine (Filabusi), Huggies 10 (Kadoma) and Timsite Custom Milling (Bindura). The suspension of the 11, according to Minister Chidhakwa, would only be lifted once Government was satisfied that the companies had fully complied. Government will not allow any mining company to be connected to the Zimbabwe Electricity Transmission and Distribution Company’s power grid without authorisation. Minister Chidhakwa said Government would set up gold mobile buying units in mining areas and also introduce free artisanal mining permits to those interested in dealing in gold and selling it to Fidelity Printers and Refiners. All gold producers are expected to have registered and been issued with artisanal mining permits by the end of this month, failure of which they risked suspension, he said. Minister Chidhakwa said Government would review mining levies and charges by various rural district councils and EMA with a view to promote viable gold production. 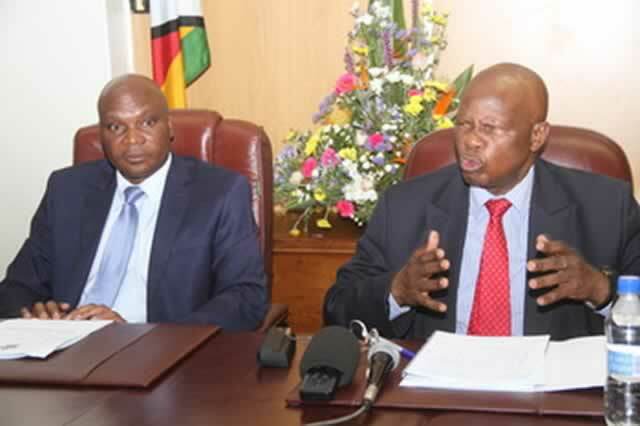 Speaking at the same function, Finance and Economic Development Minister Patrick Chinamasa said his ministry was ready to support gold producers. He said Government would soon move to restore order in the diamond mining sector.